GISWeekly examines select top news each week, picks out worthwhile reading from around the web, and special interest items you might not find elsewhere. This issue will feature Industry News, Top News of the Week, Acquisitions/Agreements/Alliances, Announcements, People, New Products, Around the Web and Events Calendar. Last week The Carbon Project previewed its new product for OGC Spatial Data Infrastructure (SDI) 1.0 interoperability for ESRI’s ArcGIS 9.2 software, CarbonArc PRO. CarbonArc PRO was preceded by a smaller product to test the market about a year and a half ago, CarbonArc Lite. SDI 1.0, a suite of standards from the OGC, is being adopted by a number of government and geospatial intelligence agencies. “We’ve created a set of products for ArcGIS that supports that SDI 1.0 baseline,” said The Carbon Project president and CEO, Jeff Harrison. For more complicated data producers, SDI 1.0 includes familiar OGC standards such Web Map Server, GML, WFS, and additional unfamiliar things like filters and catalogs, that allow users to put together complex systems much faster and at much lower cost than they have been able to do in the past. The Carbon Project’s flagship product, CarbonTools PRO, is an extension to the Microsoft .NET framework that supports advanced location content handling, mapping and sharing, and is the underlying toolkit CarbonArc PRO. 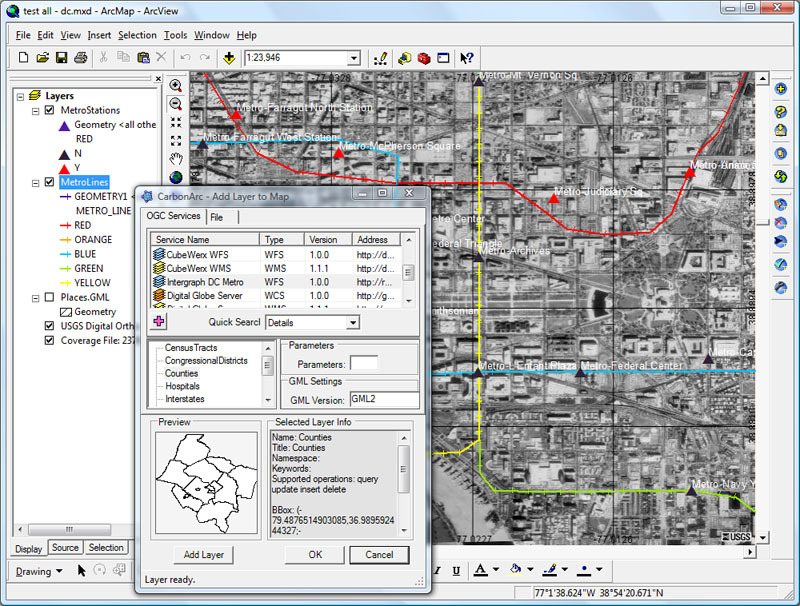 CarbonArc PRO works only with ArcGIS 9.2 and adds a whole suite of OGC capabilities. Two main features of CarbonArc PRO for feature data: the transactions and updates just described, and an OGC specification called filter. Filters in SDI 1.0 basically allow people to plug into an online service and retrieve just the information they want. They do this by setting up spatial and other operators. Prior to this product, online services has allowed you to retrieve a lot of data, but not necessarily filtered data. With filters in CarbonArc PRO you can retrieve only the data you need, not only on your desktop, but also out there on the service. Currently CarbonArc PRO is available only to ArcGIS 9.2 users, but The Carbon Project’s intention is to make the tools available on every Windows based desktop system. Government agencies are now using the standards and have multiple implementations in place. Google is a good example of how they wrapped complex functionalities under a user friendly interface. KML is somewhat similar in some elements to GML and has its own complexities. Areas in which SDI applications may find a home could be in oil and gas, insurance, environmental and planning, among professional non-geospatial users. CarbonArc PRO makes it easy for users to leverage SDI 1.0 by simplifying all the OGC complexity into a series of easy to use tools. When a user opens CarbonArc PRO they don’t see OGC or specifications, they just see a number of different services they can connect up to like they would see for Yahoo Maps or Google Maps. Harrison said there is a synergy between Google, Microsoft and Yahoo because there are many things that they do not do that OGC does provide in terms of specifications, but there are a lot of things they show OGC that OGC is trying to do. 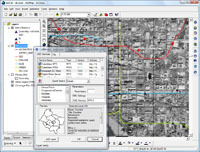 For example, KML and tile based map services have many advantages. OGC is starting to move forward on tile based WMS. Ultimately, as OGC specifications broaden their reach, more non-geospatial users and consumers may embrace them. ORBIT Geospatial Technologies announced the release of Orbit GIS Photo Locator retail solution. Orbit GIS Photo Locator autonomously places your photos on Google Earth, Google Maps, and in most GIS systems. Orbit GIS Photo Locator uses the JPG photo EXIF header to extract the position and orientation of the picture at time of taking. The images are immediately converted ready to be used in Google Earth, Google Maps, Orbit GIS and most GIS systems by using the industry standard ESRI SHP file format. Sanborn is now using ESRI's ArcGIS Image Server to provide its clients access to large imagery datasets. By enabling imagery to be quickly served to the Web, ArcGIS Image Server significantly reduces the turnaround time from image capture to review for Sanborn customers' quality assurance (QA) activities. Digital Map Products (DMP) announced a partnership with Seattle-based New Home Trends (NHT) that allows builders and developers to view critical industry data in a web-based visual interface. The two companies are now offering NHT's forecasting data with DMP's LandVision software to NHT customers in the Pacific Northwest. Tele Atlas announced Tele Atlas MultiNet(TM) China, the most complete digital map of the country available with street level coverage for more than 3,000 provincial and county cities. The company also announced it has opened a Display Technology Center in Shanghai, focused on producing visual enhancements such as 3D landmarks, 3D city maps and crossing magnifications for the Asia Pacific region designed to help make navigation systems clear and compelling to end users. Leica Geosystems Geospatial Imaging’s recent acquisition of IONIC brings the power of the Open Geospatial Consortium (OGC) and the International Standards Organization (ISO) interoperability to a wider customer base. With this acquisition, Leica Geosystems is committed to provide standards-based geospatial data management solutions to deploy spatial data infrastructures (SDI) and manage the lifecycle of enterprise data. With IONIC’s RedSpider technology, Leica Geosystems meets customers’ OGC/ISO interoperability needs, with plans to integrate the enterprise suite of solutions into new and existing products. Intermap Technologies Corp. announced that DCSE, Inc., a Geographical Information System (GIS) consulting firm specializing in the development of Web-based information and collaboration portal applications, has renewed their contract to distribute Intermap's 3D digital elevation data and geometric images.